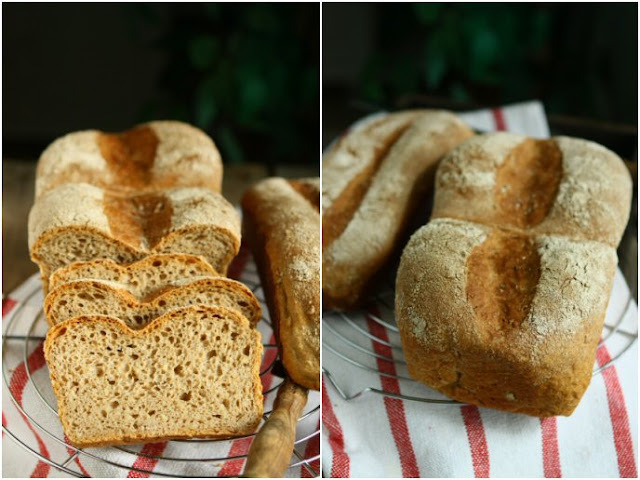 This is an easy everyday bread made with a mix of coarse bulgur, wholewheat and all purpose flours. 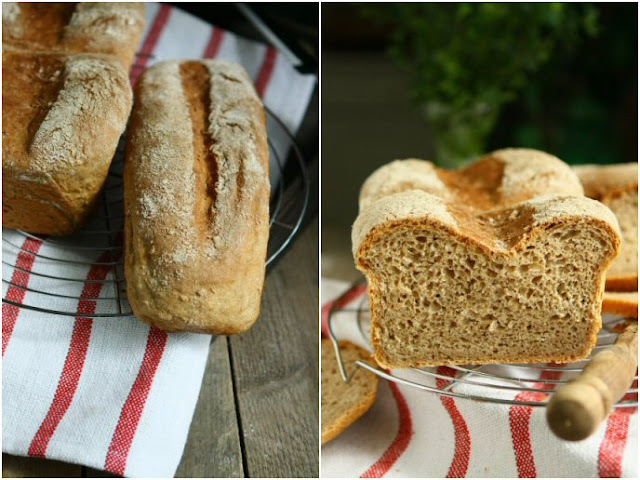 The bread has a softer, springy texture and a mellow, slightly sweet taste from nutty bulgur and honey. It is excellent for sandwiches, or toast. Bulgur, a Middle Eastern staple made from precooked wheat berries, has a wonderful nutty flavour and a lighter texture than cracked wheat made from raw wheat berries. Place bulgur in a large bowl. Add in the boiling water. Set aside to soak for an hour until tender. Line two loaf pans with parchment paper. In the bowl of your stand mixer, stir together the flours, wheat germ, and table salt. Crumble the fresh yeast over. Stir water, honey, and 3 tablespoons of olive oil into the puffed bulgur. Pour the mixture into the dry ingredients. Mix at first at slow speed for 4 minutes or until the dough comes together then increase the speed and stir until the dough has become smooth and elastic, about 5 minutes. Turn out the dough and shape into a ball. Grease the mixing bowl with a little bit oil. Return the dough to bowl. Cover the bowl with a clean cloth or plastic wrap, and let dough rise for about an hour or until doubled in size. Punch down, and divide the dough into three portions. Round up each portion of dough. Cover them with a kitchen towel and rest for 10 minutes. Deflate the dough ball. Shape two of them into balls and one into a log. Place two dough balls in the larger pan, and the log into the smaller pan, then brush the tops with olive oil and dust with some whole wheat flour. Cover and let rise 1-2 hours until doubled in volume. Preheat the oven to 190C/375F. Cut an 1/2 inch deep slash down the length of the loaves. Bake in the center of the hot oven for about 40-50 minutes until nicely brown. Cool in the pans on a rack for 5 minutes. Turn out and cool. 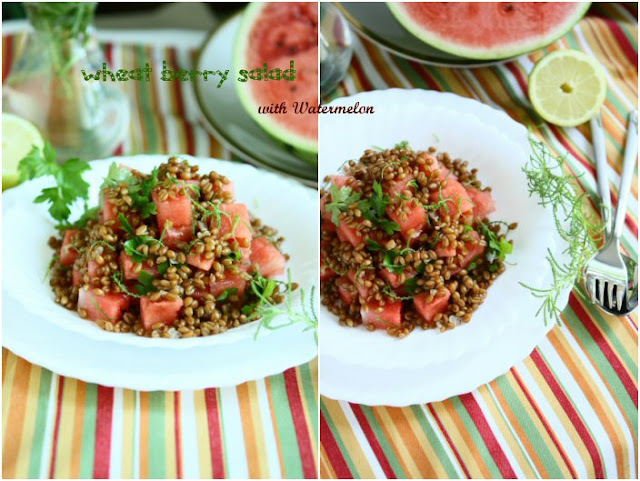 A delicious, light yet filling salad recipe of chewy, subtle nutty wheat berries and juicy watermelon tossed with a simple tangy raspberry vinaigrette. Wheat berries are high in fiber, low in calories and packed with vitamins and minerals. and are as easy as rice to prepare — perfect for a meal any time of year. You can purchase wholewheat berries at your local whole foods market or specialty food store. Combine wheat berries and water in a saucepan. Bring to a boil. Cover, reduce heat, and simmer until tender, about 50 minutes. Drain and let cool. 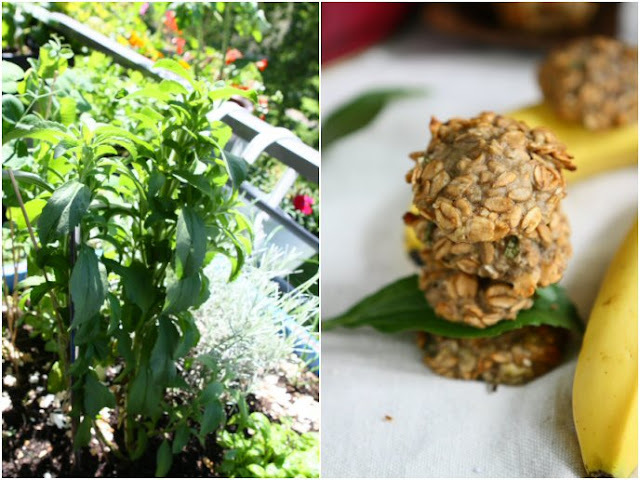 Cut the flesh from the watermelon and cut into bite size pieces, removing and discarding the seeds, and add into the wheat berries together with parsley leaves and olive herb needles. In a small bowl, combine raspberry vinegar, salt, cayenne pepper, and whisk until salt is dissolved. Whisk in the olive oil until well blended. 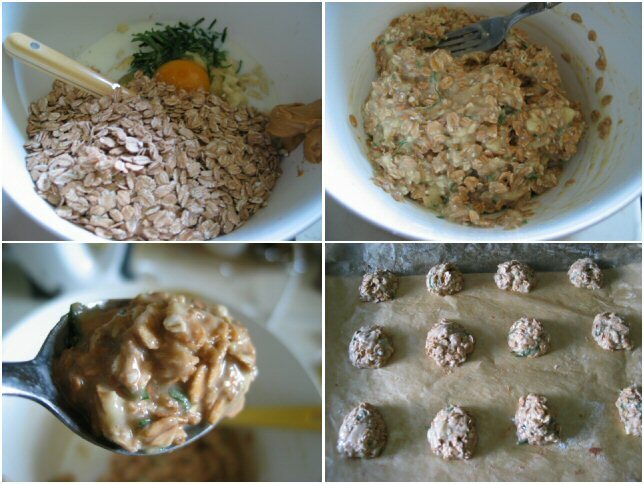 Pour the dressing over the wheat berry mixture and toss gently until everything is coated and evenly mixed. 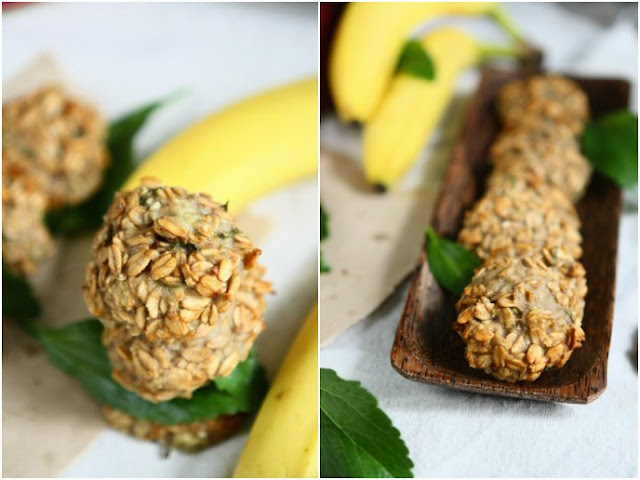 These banana cookies are free of sugar and so healthy that you can even enjoy them with a glass of milk as the breakfast. Feel free to replace rolled spelt flakes with old fashioned oats and fresh stevia leaves with other sugar substitutes or honey. Preheat the oven 160C/320F, fan forced. Line two baking sheets with parchment paper. Mash overripe bananas and mix with rolled spelt flakes, skim milk, egg, vanilla and peanut butter. Fold in chopped fresh stevia leaves. Place heaping tablespoon-sized batter onto the prepared baking sheets and cook for 20 minutes until lightly golden brown. Makes about 2 dozen of cookies. 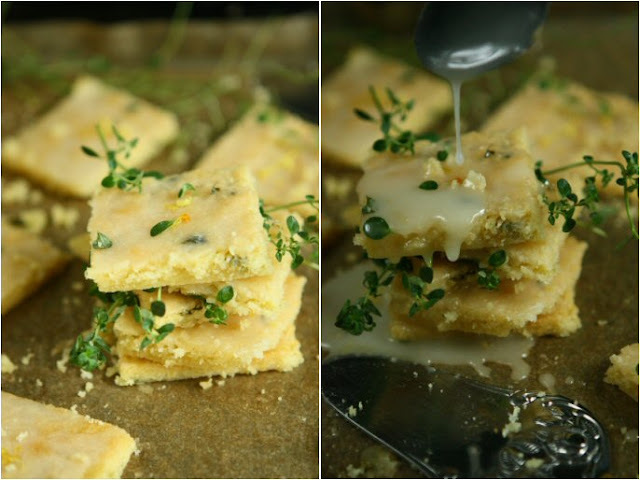 These lemon bars, adapted from Giada De Laurentiis via foodnetwork, are more of a shortbread with a thin lemon glaze. 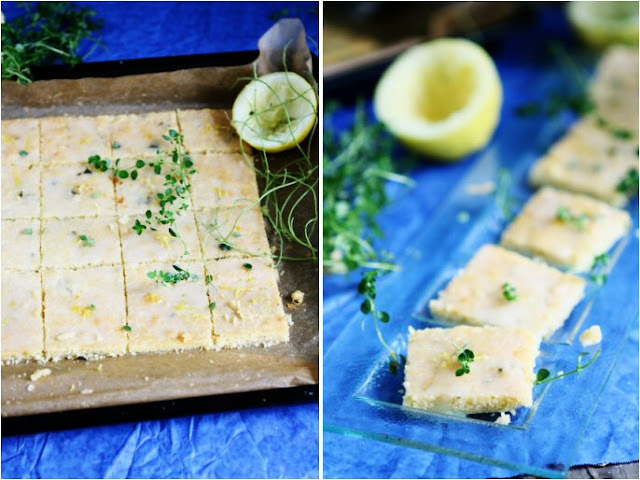 They don’t have the same texture as a lemon bar. Place an oven rack in the center of the oven. Preheat the oven to 165C/325F. Line an 8-inch baking tray with parchment paper. In a small bowl combine flour, lemon-thyme and salt. Set aside. Using a stand mixer fitted with the paddle attachment, beat together softened butter and powdered sugar on high speed until light and fluffy, about 30 seconds. Beat in the lemon juice and vanilla. Reduce the speed to low and gradually add the flour mixture. Using damp fingers, press the dough into the prepared pan. Bake for 30 minutes until golden. Cool for 30 minutes. Whisk the lemon juice and powdered sugar together for the glaze in a medium bowl until smooth. Spoon the glaze over the cooled crust. Allow the glaze to harden, at room temperature, for at least 1 hour. Lift the parchment paper to remove the crust from the pan. Cut into the bars and arrange on a serving platter or store airtight in a plastic container at room temperature. 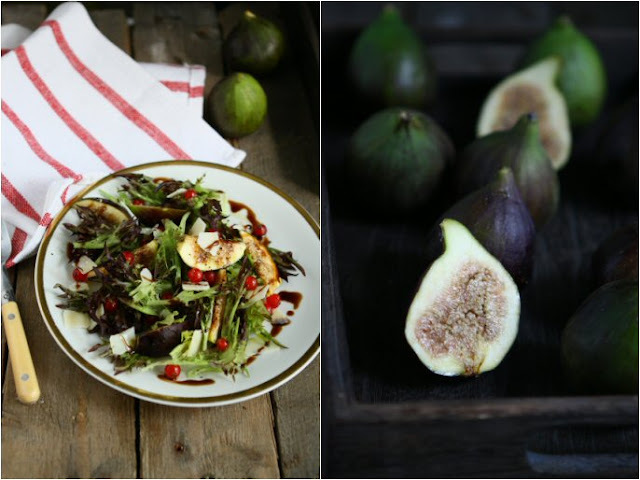 This simple yet delicious fig salad incorporates with all wonderful flavours of the saltiness of Parmesan, the sour tang of vibrant red currants and the sweetness of figs and balsamic reduction. Heat a small saucepan over medium low heat. Add in balsamic vinegar and reduce for about 5 minutes until thick and syrupy. 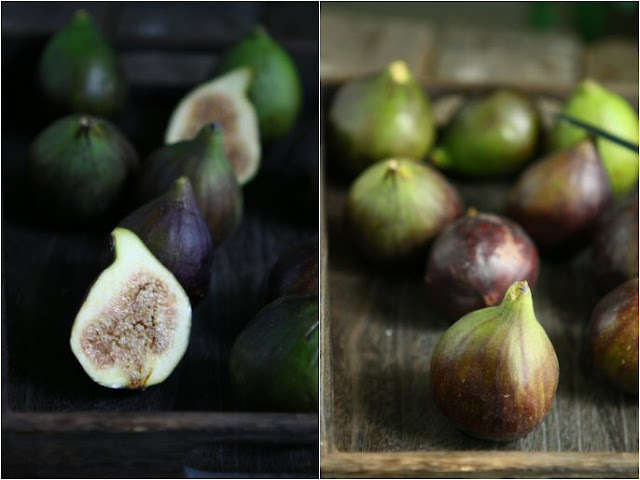 In a salad bowl, combine lollo rosso lettuce, figs, shaved Parmesan, red currants and argan oil. Divide between two serving plates and drizzle with balsamic reduction. Season with salt and pepper to taste. 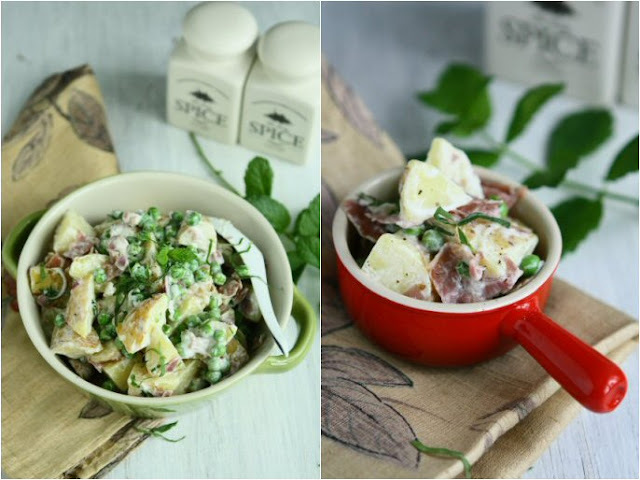 This delicious potato salad brings together new potatoes, peas, and Prosciutto tossed with a light yogurt mint dressing, an excellent compliment to just about any meat dishes. It is best served warm or at room temperature or if making ahead, place in the fridge. When ready to serve, bring to room temperature and fold in a few extra tablespoons of yogurt dressing. Place the potatoes in a large pot filled with salted water and bring to a boil over high heat. Once the water boils, reduce the heat to medium and simmer until tender, about 20 minutes. Drain the potatoes and set aside until cool enough to handle. Meanwhile, cook the Prosciutto in a large frying pan or cast iron skillet until well browned and crispy, about 10 minutes. Using a slotted spoon, transfer the bacon to a paper-towel-lined plate. Return the pan, with the bacon fat, to the stove over medium heat and add the shallot. Season well with salt and pepper and cook until softened, about 2 minutes. Add the peas and cook until tender, about 2 minutes. Remove from heat and transfer to a large bowl to cool. Once the potatoes are cool, cut into large dice and add to the pea mixture. Add the yogurt, milk, mint, and the Prosciutto and fold until the potatoes are well coated. Taste and adjust the seasoning as needed. Serve at room temperature. 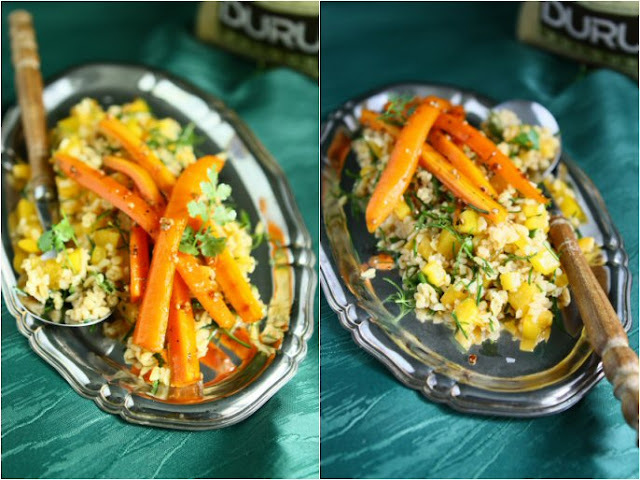 A simple and delicious bulgur salad, adapted from Eat Smarter, with coriander honey carrots giving it a hint of well-balanced earthy pungency and lingering sweetness. Bring tomato juice in a pot to a boil. Turn the heat off. Pour bulgur into the tomato juice. Cover and set aside until most of the liquid has been absorbed, about 30 minutes. Meanwhile rinse, peel and cut the carrots horizontally into 4 sticks. Crush the coriander seeds in a a mortar and pestle. Heat one tablespoon of olive oil in a skillet over medium heat. Add in carrot sticks and cook briefly. Add in crushed coriander seeds, salt and pepper. Pour in 4-5 tablespoons of water and cook, covered, for 5 minutes over medium heat. Add in honey and bring the mixture to a boil. Remove and set aside to cool. Peel, core, seed and finely dice the yellow bell pepper. Place them in a salad bowl together with chopped chives, olive herb needles if used, minced garlic, coriander leaves, lime juice, bulgur and the rest of olive oil. Season with salt and pepper. Toss everything together. 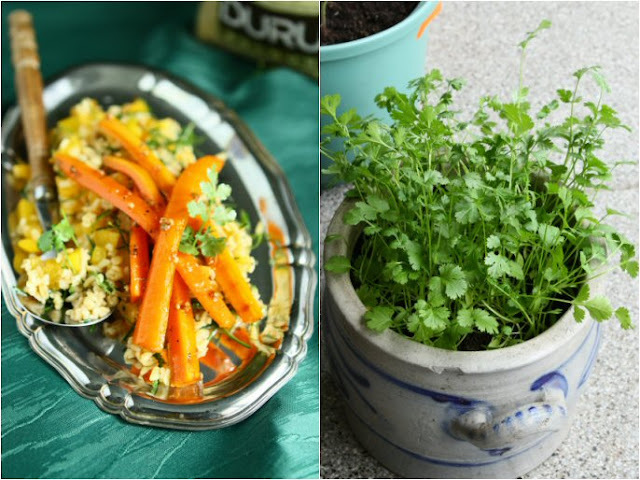 Serve the bulgur salad with coriander carrot sticks. 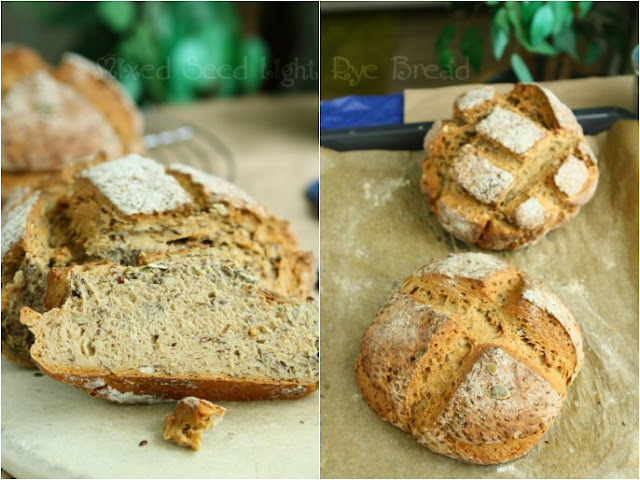 Healthy and nutritious, a delicious rye spelt bread adapted from Brot backen-Köstliche Rezepte aus der guten alten Zeit ©angiesrecipes, is strewn with a mix of flax, pumpkin and sunflower seeds and bursting with flavour. 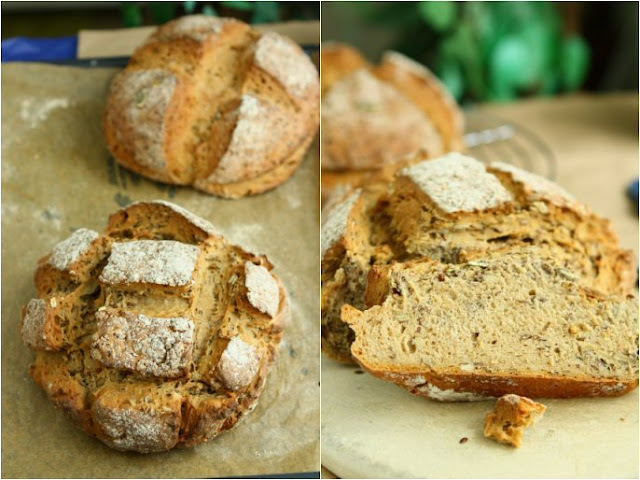 Mix light rye flour, spelt bread flour, and sea salt in a mixing bowl. Make a well in the center, and place the yeast, and honey in the well. Add in lukewarm water and a little flour from the sides of well. Stir the mixture until it resembles thick porridge. Cover with a kitchen towel and leave it aside for 15-20 minutes. Add in the sourdough and buttermilk. Stir until the dough comes together and pulls away from sides of bowl. Turn it out onto a lightly floured work surface and form the dough into a ball. Dust the ball of dough with some spelt flour and proof, covered with a kitchen towel, for 20 minutes. Push the pumpkin, flax, sunflower seeds into the dough and knead and knead the dough until the seeds are incorporated. Divide the dough into two portions and shape each into a round. Place them on a baking tray dusted with flour and proof, covered with a kitchen towel, for another 20 minutes. Preheat the oven to 220C/430F. Cut some decorative slashes on the top of bread. Bake the bread in the center of the hot oven for 15 minutes then reduce the oven temperature to 180C/350F and bake the bread a further 45 minutes. Remove from the oven and brush with water. Return the bread to the oven and bake for 5 more minutes until nicely golden brown and crusty. 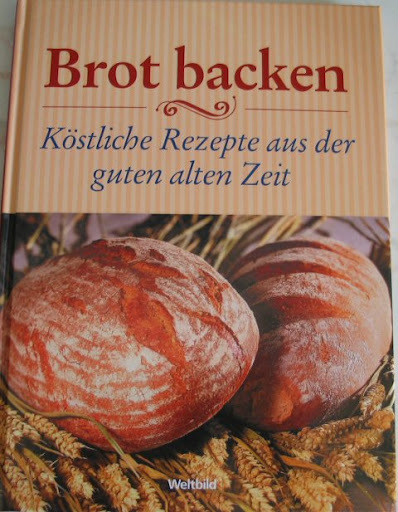 The dough ‘blanket’ is mainly prepared with Quark, wholegrain, and refined spelt flours. 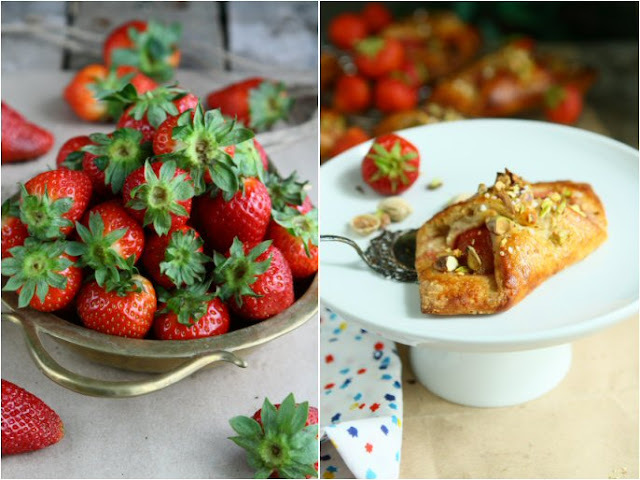 Strawberries can be replaced with banana and use apricot jam instead of strawberry jam. Quark, literally translated as ‘curd’, is a German fresh cheese, very similar to the American cottage cheese. It’s a curd cheese made from skimmed milk and soured with a lactic starter. Quark is very popular in Germany. It can be eaten plain on its own or make it into a sauce, spread, dessert or cake. Whisk the spelt flours and baking powder together in a mixing bowl. Add in quark, milk, oil, sugars and salt. With a handheld electric mixer fitted with dough hooks at high speed, stir all the ingredients until just incorporated, for 1 minutes. Don’t overdo it, or the dough will be sticky. Turn the dough out onto a lightly floured work surface. Cover it with a plastic film and roll out the dough into a 24x60cm rectangular. Cut out 10 squares, each 12x12cm. Preheat the oven to 190C/375F. 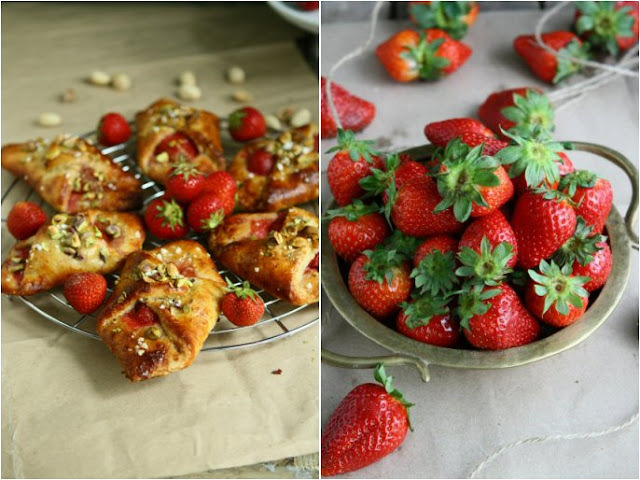 Place two strawberry halves in the center of dough. Brush strawberries with strawberry jam. Brush four corners lightly with beaten egg. Pinch two corners crosswise to make an open pocket. (look a bit like Duchess Danish pastry) Brush the pockets with beaten egg and sprinkle with chopped pistachios and sugar pearls. Bake open pockets in the center of hot oven and bake for 15-20 minutes. Serve warm with vanilla sauce or whipped cream.